Sponsored by Soroptimist International of Saguaro Foothills and Carefree Kiwanis, “ Off to a Good Start” program was in full swing back on July 24th as members stuffed school supplies in colorful backpacks for the children of CCUSD and surrounding areas. Each year Kiwanis makes a generous donation to help support this much needed program in the district. Children of families in need are given backpacks to start the new school year off right with basic school supplies. This year 220 backpacks will be distributed to CCUSD, Black Canyon City, New River and AZ Helping Hands foster kids program. 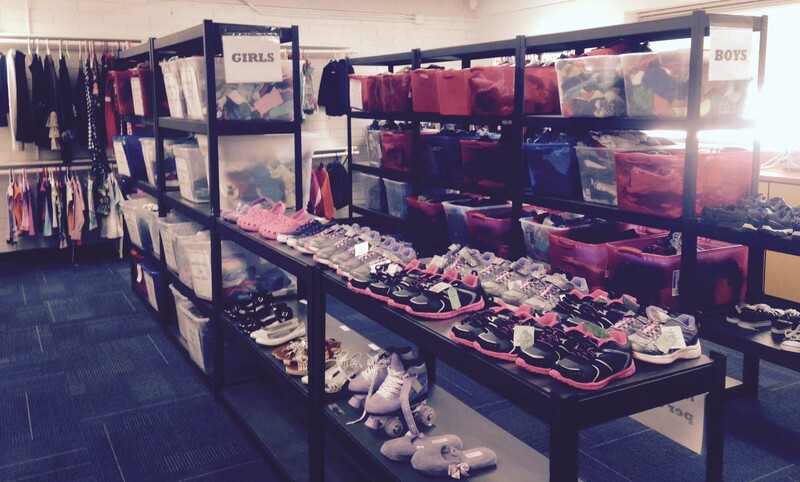 Bobcat Closet is stocked with new and lightly used clothing and shoes for elementary children. It is free for families in need. Carefree Kiwanis is a strong sponsor of Bobcat Closet and their support is greatly appreciated by SISF and program creator Matt Owsley, principal of Black Mountain Elementary. Families will have access to the Closet during the school year, the 1st & 3rd Wednesday from 9:00-11:00am. Please call 480-575-2100 for more information. SISF would like to invite you to join us, Saturday, September 23, 2017 for the “13th Annual Shopping Extravaganza at Outlets at Anthem” 9:00am – 4:00pm. Please join us for a fun filled day benefiting 18 local charities, which includes SISF, and receive exclusive discounts up to 70% off, lunch, wine tasting, chocolate tasting, prizes in stores, live entertainment and gift bags!! Invite family and friends to join you and get your holiday shopping done early. Tickets for this fantastic event are $25.00 and must be purchased in advance. For more information and to purchase tickets, please contact Carolyn Lutz at clutz2765@gmail.com or 602-568-5005.